In addition to the domesticated potato, there are many wild species that are native to both North and South America. 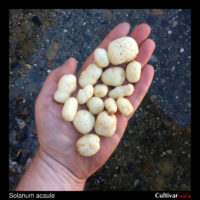 We offer wild potato seeds and sometimes tubers on an irregular schedule. Our wild potato seeds are generally produced from collections made in a variety of places, representing the overall diversity found in that species. They are suitable for general growing and breeding work, but if you are looking for a specific trait, you might be better served by requesting accessions from a gene bank. Demand for these species is low and so we don’t grow most of them every year or produce very much. In most cases, we sell the species, not any particular variety. You may get tubers of different phenotypes in the same packet.